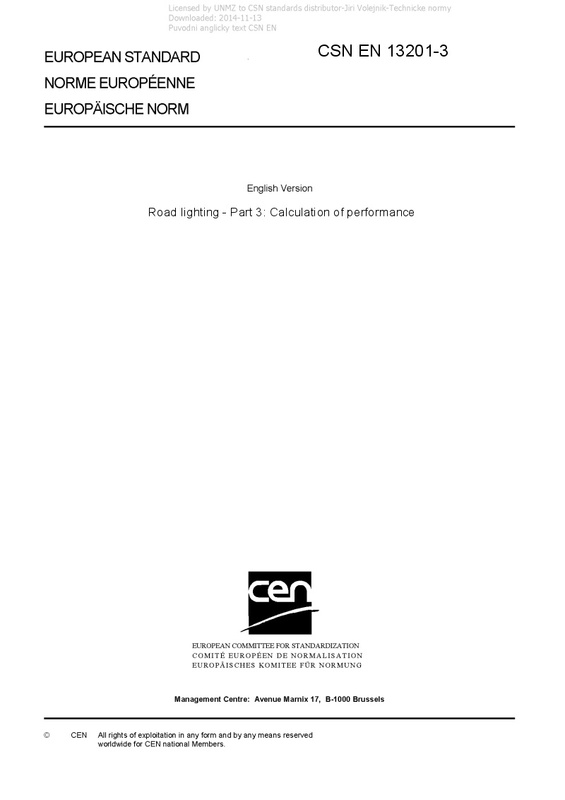 EN 13201-3 Road lighting - Part 3: Calculation of performance - This European Standard specifies the conventions and mathematical procedures to be adopted in calculating the photometric performance of road lighting installations designed in accordance with the parameters described in EN 13201-2 to ensure that every lighting calculation is based on the same mathematical principles. The design procedure of a lighting installation also requires the knowledge of the parameters involved in the described model, their tolerances and variability. These aspects are not considered in this part of EN 13201 but a procedure to analyse their contribution in the expected results is suggested in EN 13201-4 and it can also be used in the design phase.